MULLIVAIKKAL, Sri Lanka (AP) — Sri Lanka’s ethnic Tamil politicians, religious leaders and civilians gathered Monday under heavy surveillance at memorial ceremonies on the battleground where thousands died in the final days of the decades-long civil war that ended in 2009. Lawmakers and local leaders lit earthen lamps and offered flowers at a makeshift memorial in Mullivaikkal village in northeastern Sri Lanka where thousands of people were killed in fierce fighting between the army and Tamil Tiger rebels. Civilians largely kept away at this event as several Sri Lankan intelligence agents and police were watching those attending the ceremony. Even journalists covering the ceremony were followed and Sri Lankan security agents listened in as they interviewed civilians and politicians. Police had obtained a court order prohibiting any memorial that might be perceived as glorifying the dead rebels who were fighting to create a separate state for ethnic minority Tamils in the island’s northern and eastern regions. Mullivaikkal was the site where the beleaguered Tamil Tiger rebels were caught in the final days with hundreds of thousands of civilians and mounted their last stand against the security forces. In the last days, government troops killed rebel leader Velupillai Prabhakaran and the entire Tamil rebel leadership along with scores of civilians. 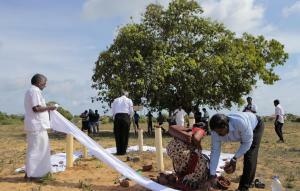 Tamil leaders appealed to the international community to do more to ensure justice for the people killed in the war. “The Mullivaikkal incident left indelible marks on the collective human conscience of our people,” C.V. Wigneswaran, the provincial chief minister of Tamil-majority north said. 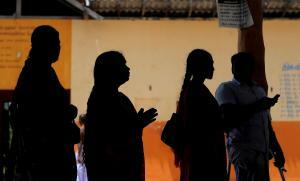 Both Sri Lankan forces and Tamil Tiger rebels were accused of committing serious violations. The government was accused of deliberately shelling civilians and hospitals, denying food and medicine for the civilians and deliberately undercounting the number of civilians trapped in the fighting. The rebels were accused of holding civilians as human shields and recruiting child soldiers. Lawmaker Suresh Premachandran expressed disappointment that the new Sri Lankan government had restricted the people’s right to remember their dead loved ones while appearing to promote ethnic reconciliation. “What sort of democracy do they have? You can see how many police we have over here,” Premachandran said. Mullivaikkal had been closed to the public for a long time since the war’s end amid allegations that the authorities were destroying evidence of atrocities. Even after civilians were allowed to resettle the area had been under strict surveillance. Later Monday hundreds of civilians and clergy gathered at the Roman Catholic church in Mullivaikkal where they lit candles, incense sticks and offered flowers at symbolic gravesites and wept over them. Police watched from outside the church premises as mourners read poems on the people’s sufferings, denouncing the war and the international community’s inaction to save lives. “Weeping for the dead is a basic need and this has been denied to us for so long,” Rev. Jeyabalan Croos said in his sermon during Mass.